The Last of Us’ DLC came out yesterday and I thought I’d do a review. So that it’s topical and stuff. For those who want to know what I thought of the original game, well, I wrote a paragraph on it a couple of blogs back. I liked it, basically. I'm also going to moan about Tomb Raider a little bit. Bear with me. 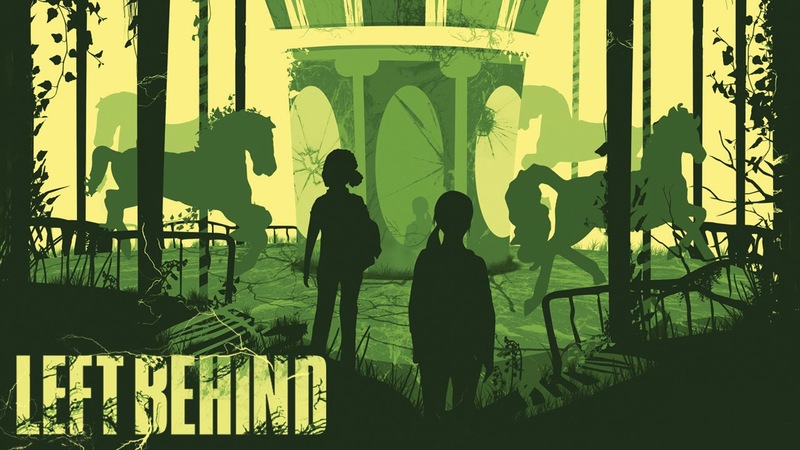 So Left Behind is split into two halves, one being a prequel to The Last of Us' main story and one filling in a plot hole that wasn't much of a plot hole. The latter feels somewhat like an extended deleted scene, one that doesn’t particularly do much to further the story or the characters but does include more of The Last of Us’ signature style of action: Stealthy brutality with a general sparsity of ammo. Like in the original game, these sequences are at their best when you’re given free reign to plot your own route between each room while trying to keep your wits about you as the Clickers click-clickety-click just a few feet away. Because it’s so easy to mess up these parts the tension is always high, and Left Behind manages to contain just the right balance of these scenes to stop things feeling repetitive - that’s one fault of the original game if I had to think of any. But it’s in the other half of this DLC that the interesting stuff happens. We meet Ellie’s friend Riley and basically spend the whole time walking around and ‘hanging out’ with her. It’s the sort of narratively heavy approach that really, really wouldn’t work if the writing and performances weren’t absolutely top-notch. Luckily, they are. There’s an element of mystery to the character of Riley that keeps things moving, but for the most part it’s just the two friends stumbling across things and hanging out together. It’s done so believably here that it’s almost a shame when we have to get back to shooting things. I’ve been playing last year’s Tomb Raider recently, and the gulf in sophistication in the storytelling here is ridiculous. Bear in mind, Tomb Raider was praised by most reviewers as being a dark and thoughtful reimagining of gaming’s most famous video game heroine, putting character development first and foremost. I was always skeptical, however, because of how cartoonishly over the top the whole grittiness thing went. In my opinion, the mishmash of “seriousness” and fast-paced mass-murdering gameplay in Tomb Raider was almost farcical, and people seem to have also overlooked how simplistic and cliche much of the dialogue could be. “I’m here. You’re safe now.” “You saved me. I knew you would.” “I made you a promise.” Congratulations, Tomb Raider, for proving that video games have now successfully reached the level of maturity of such ‘works of art’ as The Mummy: Tomb of the Dragon Emperor. Luckily Tomb Raider was still pretty fun, but there was nothing remotely clever about the characterisation of Lara. With her infinite athletic endurance in spite of the horrific graphic injuries she’d sustained over the course of the cutscenes alone, she wasn’t a believable character. So, yeah, I really don’t understand all the praise that game got for being ‘realistic’. Ellie in The Last of Us is the polar opposite of that. She talks and behaves like a real person. There are a lot of subtleties to her behaviour. Sometimes she can be annoying - but this isn’t because of bad writing, it’s because she’s behaving like any cocky tormented teenager would given the situation. Since she’s the star of this DLC and not Joel, I guess we’re going to get more of the obvious ‘hurr hurr Ellie looks like Ellen Page’ comparisons again. I think that does a bit of a discredit to the work Naughty Dog have achieved here in fleshing out the character, although there is one thing that… because of the recent news regarding… shhh! So not everyone will like Left Behind. There’s very little ‘gameplay’ here and the pacing is slow. Personally I admire the low-key approach, it sticks out well amongst a sea of what I like to call ‘Michael Bay’ games. The overall experience is much closer to something like Telltale’s Walking Dead series (albeit with a hundred times the budget) than, say, Call of Duty. It’s over in 2 hours flat, so you might want to ask yourself whether it’s worth the asking price (if you didn’t get it in the super-reduced season pass bundle like you totally should have). As for me, I’m actually warming to the movie-like length for a product like this. I can see more and more of this sort of thing happening in the future. Look, I don’t have enough time to sink 20 hours into every new game that comes out; for a big budget, linear, story driven game in particular, it’s an awfully big ask to pad things out without resorting to cheap gameplay rehashes. BioShock Infinite’s Burial at Sea is another good example of how the shorter length can work well these days. Just get the pricing down to the point where gamers will stop moaning and we’ll all be happy. Oh, also, Sony, please don't make me download and install five billion updates when I've already downloaded the DLC. Thanks.